To remove the poor, so England would not have to support them. To provide relief to persecuted Protestants such as the Salzburgers. 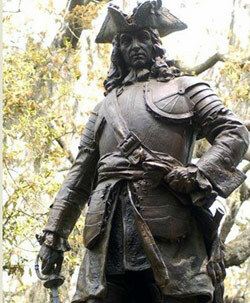 To act as a buffer to protect South Carolina from Spaniards in Florida. To strengthen the British Empire by the success of the colony and its population. To have the colony supply raw products such as wine, hemp, silk, flax, etc. to manufacturers in England. To establish another market for exported English made products. Oglethorpe and his group of 114 settlers arrived from England on February 12, 1733. They first landed in Beaufort, South Carolina, then traveled down to the Savannah River, then eighteen miles up the river. Oglethorpe wrote that he had chosen a forty foot bluff, high above the river with sandy soil and a spring. He noted that he felt that the area was healthy as the local Indians liked it too. Oglethorpe met and became good friends with Tomochichi, chief of the Yamacraw Indians, a tribe that he apparently formed from some Creek and Yamasee Indians. This, after decades in which Indians in Georgia and elsewhere had been decimated by the diseases of the Spanish and the Indian slave trade of the French and English. Many groups of Indians were coalescing as nations or “tribes” of mixed heritage and were learning how to deal with the English economy more successfully. Oglethorpe was lucky to have in his group a lady by the name of Mary Musgrove, whose mother was Creek and father English. She served as interpreter between the general and the chief, and was later rewarded handsomely for her work. The Chief requested that Oglethorpe provide a Christian education for his tribe and in particular, his nephew, Toonahowi. Oglethorpe obliged and on one of his trips back to England he brought the Chief, his nephew, and a number of other tribesmen. Toonahowi made quite an impression on the King’s court and in particular with the Duke of Cumberland, who gave the boy a watch. The young boy was so impressed, he named his island after the Duke- which is how we got the name for Cumberland Island. Mary Musgrove (whose Indian name was “Coosaponakesee”) married three different Englishmen. The first was John Musgrove, a trader, who died of malaria. She remarried briefly to a man name Matthews, who also died. But her third marriage was to the Reverend Bosomworth, a shrewd fellow who abused Mary’s reputation to acquire property and position. She established an important trading post, just outside the city of Savannah, in an area now owned by the Georgia Ports Authority. The because of its archeological importance, the site was exhumed and many artifacts were removed for storage and display. Savannah grew to become an important trading port. The Savannah River was a vital pipeline for transporting pelts and deer skins from Augusta and other smaller towns along the river. Indigo and rice were important crops, exported to England until the Revolutionary War. In 1793, Eli Whitney invented the cotton gin at Mulberry Grove, just up the Savannah River a few miles above the Hullahan Bridge. While cotton had been an important crop before, with the invention of the cotton gin to mechanically remove the seeds from cotton, cotton became “king”. Many of the old buildings along River Street were part of the original cotton exchange built in 1817. The first two floors were for the cotton coming into the port. In 1853, three more floors were added; the third floor for storage, and the 4th and 5th floors for offices. Soon the whole riverfront bluff was comprised of alleys and walkways connecting the buildings. Later iron and concrete walkways connected the buildings to the bluff. These walkways were called “Factors Walk”, due to fact that the workmen who calculated the price of cotton were called “factors”.